Victoria H. Smith: Thought I Post my first Winner's Badge! Thought I Post my first Winner's Badge! 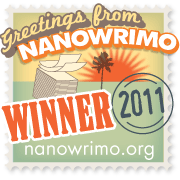 So, it's official...I am a NaNoWriMo Winner! Since I completely my word count I got this fancy badge! I am so excited it's been a great experience and if I happen to be starting another book around next November I will definitely do it again. Good luck to all who are still doing it, the finish line is definitely in sight for you all! About to Attack the Demon!